A French Perspective » Discover France » Things to do in Lille : Escape for a stylish French weekend! If you live in London and are looking for a great weekend or something different to do that doesn’t require long travelling hours or stressful airport check-ins, Lille might be your perfect destination! 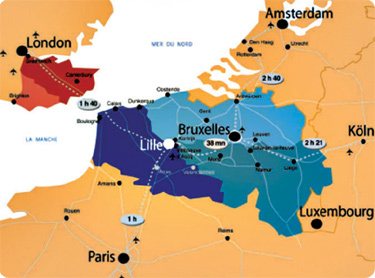 Let me help you to locate Lille: North West of France, only 10 miles from the Belgium border, 1 hour drive from Brussels and 1h26 from London by train: pretty accessible, hey? Ah, and you can also combine Lille with a nice little escape to Paris, the TGV (high speed train) takes you straight there in no time! So whether you want to concentrate in a lovely weekend in Lille or use it as a central or stopping point of a trip that can include Amsterdam, Brussels, Paris and Lille you won’t regret your choice! To be honest, coming from the South of France Lille has never been on my bucket list, that being said, I have always heard very nice things about this Northern France city that is known for being very international, well connected and charming so when my friend Elodie left Nice to move back to Lille I did not wait very long to book my Eurostar tickets to see her, and discover Lille! As mentioned above, Lille is a direct train destination from London: 1h26 minutes on the Eurostar from St.Pancras International train station so I don’t know why Londoners don’t make of Lille a regular weekend destination, it’s such a great and easy to reach French break! I must say, I love being early and have some free time at this station. The station and its architecture are a point of interest by themselves but what I love the most is checking the shops and taking my time: you will find from a Mark and Spencer’s to the most trendy English fashion retailers and everything in between (Mac and Rituals makeup, Hamleys etc). You can also enjoy delicious barista coffee or some tea as there are many coffee shops to chose from! Personally I love stopping by at Fortnum & Mason, Jo Malone, John Lewis and Rituals before drinking my coffee at Costa (yes I know, but it’s kind of my favorite spot there). You can also relax at the champagne bar on the mezzanine. 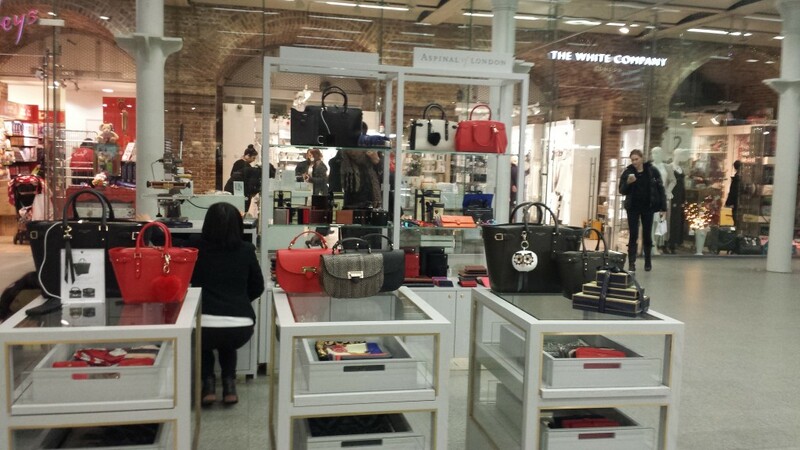 So start your French trip in style by allowing some extra time at St.Pancras. When your short journey starts, it won’t be long before you arrive to Lille Europe train station which is actually located in the city center, very close from all buses, taxis and metro services. You can also walk to the main square where the best hotels are located (15 minutes). After spending 3 days in the center of Lille and checking the capital of North France and Flanders under the guidance of my local guest, I can only highly recommend Lille as a weekend destination, especially before Christmas to see their renowned Christmas market and decorations. I highly recommend you make your way to this museum which is very close to the pedestrian streets and so the city center. The exterior architecture is as worth as the incredible art collection it hosts. Definitely a must-see! You can drive to Brussels easily on a free high-way or take a direct train from the main train station and you can be tasting the most amazing chocolate samples in less than an hour! 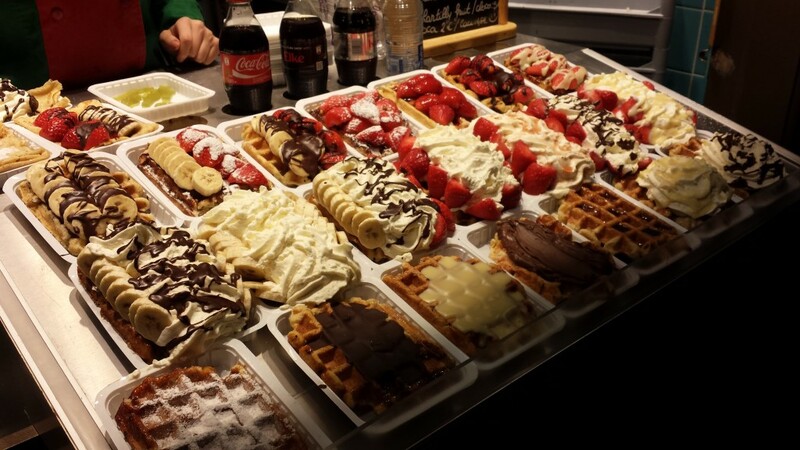 Visit the marvelous Grande Place and don’t forget to pick-up a gauffre (waffle) on your way! 8. 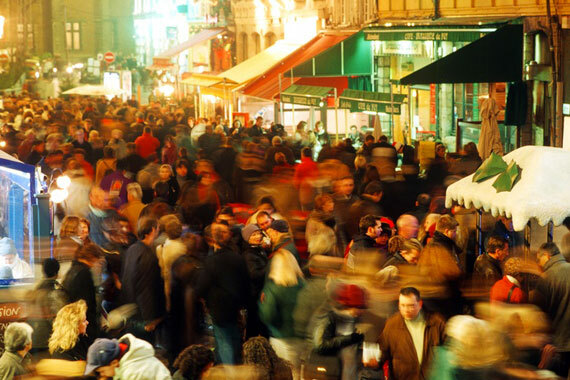 Shopping, shopping & shopping: Lille has it all! Get lost in the charming pedestrian streets of the Old town (le vieux Lille) and marry charm, architecture, French allure and lots of shopping options! Le vieux Lille is very frequented on the weekends as you can find from high street French brands such Kookai, San Marina, Camaieu, Etam etc to the prestigious Galleries Lafayette and almost every thing in between! 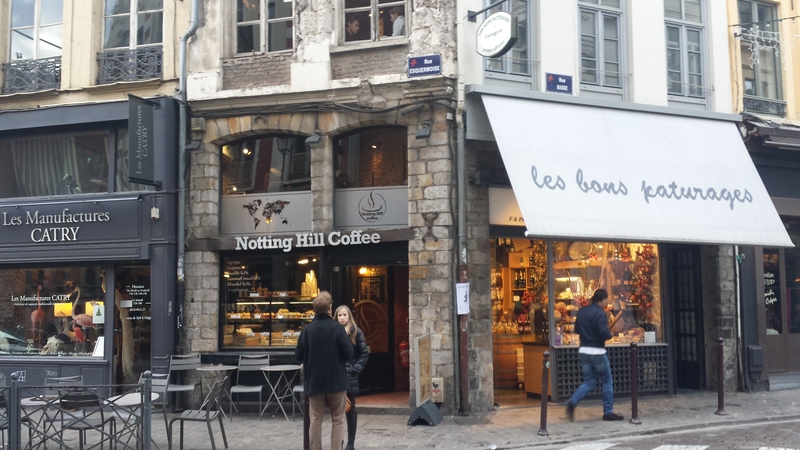 The pedestrian shopping streets also host typical brasseries, coffee shops, bakeries and.. waffle and crepes take away! Parfait! If you don’t have enough and want more shopping, try Euralille shopping center located by the train station where, a part from hundreds of retailers, you can find a Carrefour supermarket, perfect for some French food shopping before leaving! 7. Try the local gastronomy: Discover the charmfull Estaminets! These are the cutest restaurants you will ever come around: typical, traditional, joyful and very local! You can find them everywhere lost in the old town, especially within the pedestrian streets. One tip: make sure you are hungry, the cuisine lilloise is, without a doubt, comfy, generous and calorific food! Mmmhhh but c’est si bon! 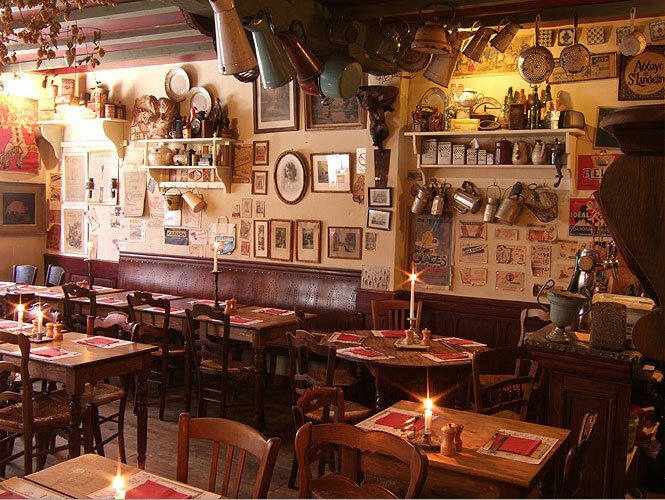 Tip: “Au Vieux de la Ville” is a real icon in Lille and a very renowned Estaminet so you must book in advance. Otherwise, there are many great value for money Estaminets close by: 2, Rue des Vieux Murs, Lille, France (Vieux Lille 3). The North of France, due to its proximity to the Belgium border is known for its high quality beers. Almost everywhere in town you can see people drinking beers (and not red wine) all day long. The beers menu is incredible and you can chose from, at least, 20 different local beers. Embrace Lille and lose yourself in a beer tasting! 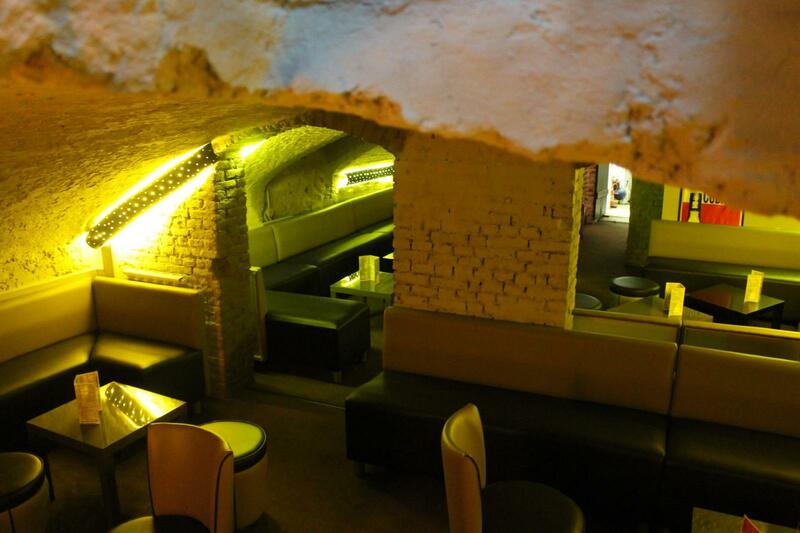 Tip: in the old Lille, “caves” are very typical so I highly recommend you have a nice local beer in one of the underground “caves”, it is charming and pretty special. I loved this bar: “The Feel good”: 73 Rue Saint-André. 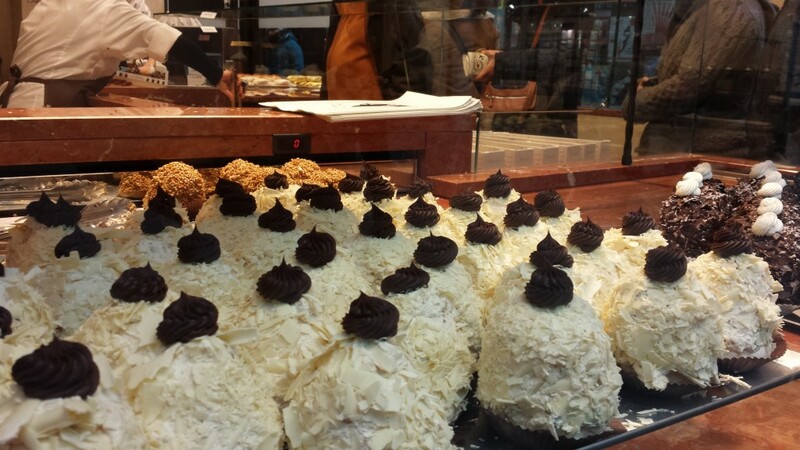 The Lillois are more than proud of this beautiful bakery: its specialty are these generous type of meringues topped with chocolate. They are so delicious that you will find a huge queue not only in Lille but also in London, Paris and Brussels where the patisserie has already a name by itself… the next opening is going to be in NYC! That just says who good they are! If you still have some room, try some delights from Meert, a high end fine patisserie (macarons, tarts, chocolates… delicious). I was amazed with the ambiance in Lille. Elodie made me discover this amazing street only known by locals and very frequented on Thursday by students and on Friday and Saturday by “older” locals. It is a very animated long street with all sorts of bars, pubs and even clubs. It is very easy to find from the city center so if you fancy some music, great beers and have lots of fun the way locals do: head to Solferino street in Lille! If you are going to Lille for the weekend I really advice you to check this local market: discover the regional cheese, home-made pastries, beautiful artisanal bread, full on treats and even beers! 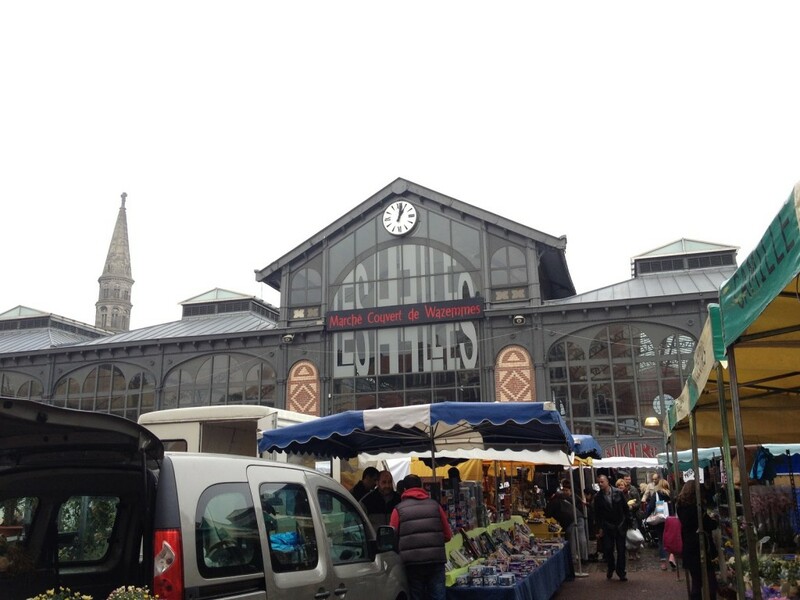 Do your shopping like a local and bring back the very best products of Northern France. This market opens only on Sunday morning and it is located Place de la Nouvelle Aventure, near Gambetta underground parking. J’adore! 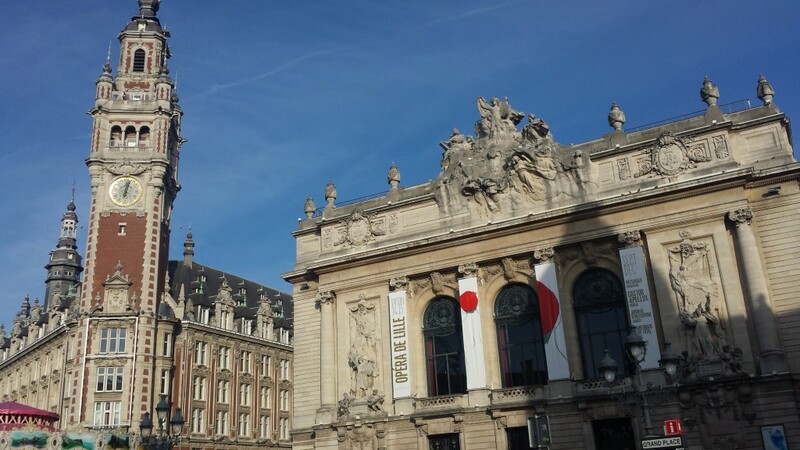 Well, basically that is the main attraction of Lille: the city center itself! Just head to the Grande Place (main square) and get lost, that is it! Enjoy the architecture and the monuments such: l’Hotel de Ville, la Chambre de Commerce et d’Industrie, the tower Beffroi, the Grande Place, the Ancienne Bourse, the Opera… and it all happens in the pedestrian city center right by the best hotels and main shops. That is what I loved the most about Lille: a concentrate of charm and architecture in the center. Allow at least one day in the city center to live Lille to the fullest, you will just fall in love with this French town! 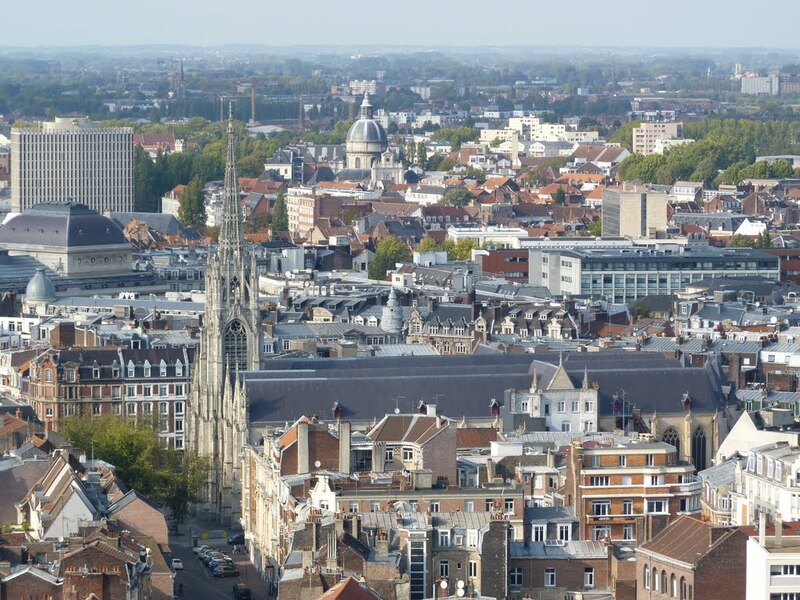 104 meters high: this is simply the symbol of Lille and a must-do attraction. It is, in fact, the highest municipal building in France and, along with the rest of 23 beffrois, it is a UNESCO heritage. Be ready for some exercise as you will have to climb 100 steps before finding the reception. Afterwards a lift will help you but you still need to climb some more steps! The view over the old town is definitely worth the effort! Bon voyage! 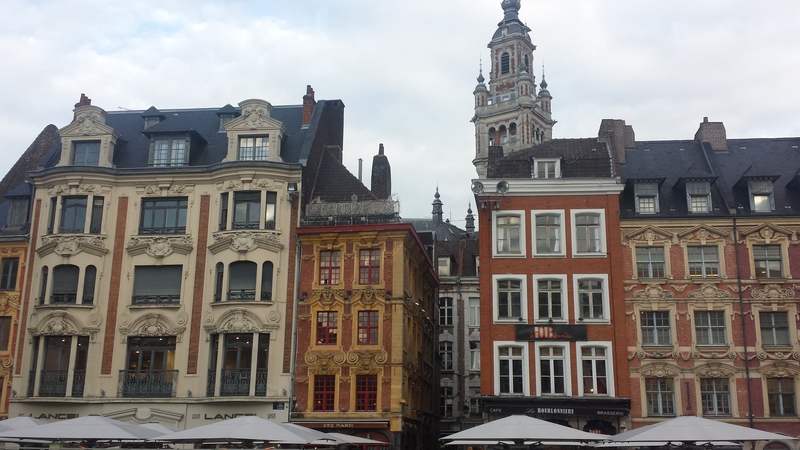 Share the beauty of Lille and don’t forget to follow me for more travel and lifestyle insights. Merci!